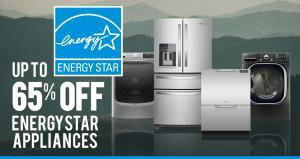 BROOKLYN, NY, USA, April 10, 2019 /EINPresswire.com/ — Appliances Connection is proud to announce that we’re celebrating Earth Day 2019 by offering the best deals on the most efficient appliances. We’re so committed to environmental consciousness, we’re not limiting your savings opportunities on conservation ready appliances to April 22nd. Appliances Connection is giving you competitive pricing on these green machines for almost two weeks, from April 11th until April 24th. Take a look at these Earth-friendly brands. Hailing from the island nation of New Zealand, Fisher & Paykel has, by necessity, had to cater to a population that demands compactness and efficiency. They’ve exported this outlook to the US in their built-in drawer dishwashers. They actually pioneered the dishwasher drawer in the mid-200s and evolved it into their newest models of Fisher & Paykel Tall Series Double DishDrawers. Hand washing a full sink of dishes can use up to 30 gallons of water. Double DishDrawers can do the same amount of dishes using half that amount. An advantage these units have over traditional dishwashers is the ability to wash half-loads, further reducing water consumption. It’s not merely water these Fisher & Paykel dishwashing drawers help you save. Every model is Energy Star certified, meaning that they’ve been tested for minimum energy efficiency standards. During our Earth Day 2019 sale, buy a qualifying Fisher & Paykel range or cooktop/wall oven combination and a qualifying Activesmart integrated refrigerator, and you’ll get $1,300 off the purchase of a qualifying Fisher & Paykel DishDrawer. When it comes to residential appliances, Liebherr has made refrigeration their sole business. A particular area where they’ve stayed ahead of the curve is in environmental compliance. Every time an Energy Star requirement has been announced, it can be guaranteed that Liebherr has already implemented it. The interiors of all their refrigerators are illuminated by LED lighting. This is much more energy-efficient than standard refrigerator bulbs while also maximizing visibility within. Recently, the US EPA recommended that R-600 (isobutane) be used in the place of Freon as a refrigerant. The latter is known to contribute to climate change and ozone depletion. As well as being environmentally friendly, isobutane is a more effective coolant at significantly lower quantities, reducing electricity consumption. True to form, Liebherr has been using isobutane for 17 years. All Liebherr refrigerators feature a "door ajar" alarm that guarantees the unit is closed properly, preventing cold air from escaping and any energy wastage. These are just a few reasons why 14 Liebherr refrigerator models have earned the Energy Star "Most Efficient of 2018" designation, a distinction they've received eight years in a row. Recently, Liebherr introduced their Monolith series column refrigerators, all of which are Energy Star certified. As the name suggests, these are imposing beasts of refrigerator/freezer columns. The monolith series is one of the best refrigeration customization systems out there. With columns ranging from a modest 18 inches in width to pairs spanning a massive 72 inches wide, there’s a refrigerating solution for you. For a limited time, when you purchase a Monolith column, you’ll get $250.00 off a qualifying undercounter refrigerator. Appliances Connection is your only destination for the finest efficient appliances this Earth Day and every day.